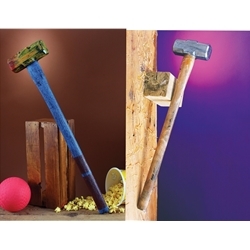 The Circus Sledgehammer comes in one of two assorted styles as pictured based on availability. The Sledgehammers are made of plastic and measure 24” x 5” x 2”. Step right up and test your strength with the Circus Sledgehammer! This prop makes for a great accessory to any kind of Carnival-themed costume, invoking childhood memories of the strength tester game. The Sledgehammer can also be used as an accessory for an Evil Clown, a Railroad Worker, or a Gang Member.